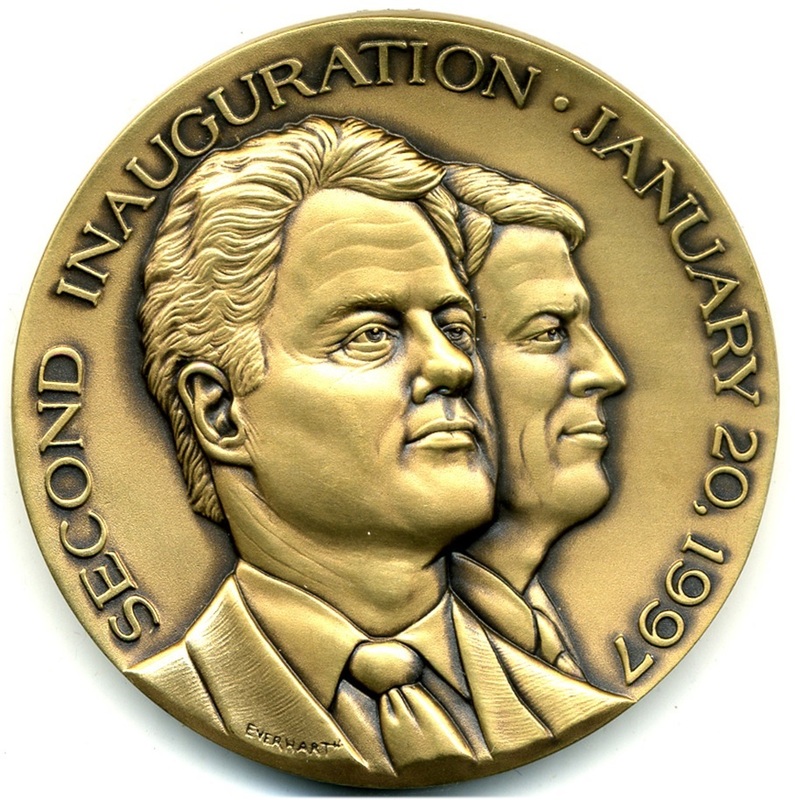 Bill Clinton Inaugural Medal – Rare Mule, 1997 – This wonderful hard-to-find piece is 69.8mm. Bronze. Don Everhart, Jr., (Obv.) Jurek Jakowicz (Rev. ), Sc. (MACO). Choice Uncirculated. The obverse bears the standard official portraits of Clinton and Gore with the legend, SECOND INAUGURATION. JANUARY 20, 1997. The reverse legend: SECOND INAUGURATION JANUARY 20, 1997 BUILDING BRIDGES/ TO THE 21ST CENTURY surrounds a view of a family crossing a modernistic bridge with skyscrapers in the distance. The Chairman of the 1997 Inaugural Medals Committee was Sen. John Breaux of Louisiana. His close friend, former Congressman Jimmy Hayes of Louisiana (the Chairman of the 1993 Committee) , served as Vice Chairman. 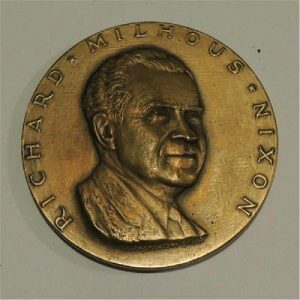 Proposed designs for the official medal were submitted to Sen. Breaux who forwarded them to the White House. 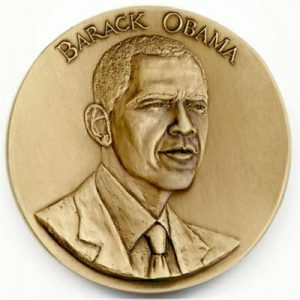 Ultimately, the President selected the obverse and reverse design executed by Don Everhart, Jr. and submitted by the Medallic Art Company. 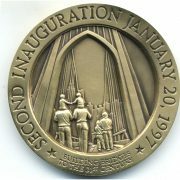 However, a second reverse design submitted by MACO and designed by Jurek Jakowicz was so well liked by Breaux & Hayes that they had its “Bridge to the 21st Century” design “muled” with the selected obverse to create a second Official Inaugural Medal. 12 of them were struck in silver and presented to Medals Committee members and others. 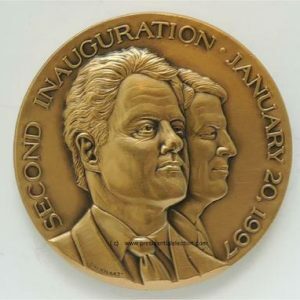 200 were struck in bronze; 150 for distribution to persons active in the inaugural and 50, donated by Hayes, to the State of Louisiana Museum of Political History. Under the terms of this gift, none of the 50 medals could be sold for ten years, and thereafter, only one per year could be sold for the purposes of the museum. The members of the Medals Committee paid for the medals presented to them and Hayes paid for the remainder. The medal offered here is therefore one of only 200 bronze Official Inaugural Medals with the “Bridge” reverse; a design which the President liked, but rejected because of his concern that a campaign theme was inappropriate for an inaugural medal.